Joubert syndrome (JS) is an autosomal recessive disorder that is described in patients with cerebellar ataxia, mental retardation, hypotonia, and neonatal respiratory dysregulation. Kidney involvement (nephronophthisis or cystic renal dysplasia) is associated with JS in one fourth of known cases. Mutations in three genes—AHI1, NPHP1, and NPHP6—have been identified in patients with JS. However, because NPHP1 mutations usually cause isolated nephronophthisis, the factors that predispose to the development of neurologic involvement are poorly understood. In an attempt to identify such genetic determinants, a cohort of 28 families with nephronophthisis and at least one JS-related neurologic symptom were screened for mutations in AHI1, NPHP1, and NPHP6 genes. NPHP1 and NPHP6 homozygous or compound heterozygous mutations were found in 13 (46%) and six (21%) unrelated patients, respectively. Two of the 13 patients with NPHP1 mutations carried either a heterozygous truncating mutation in NPHP6 or a heterozygous missense mutation in AHI1. Furthermore, five patients with NPHP1 mutations carried the AHI1 variant R830W, which was predicted to be “possibly damaging” and was found with significantly higher frequency than in healthy control subjects and in patients with NPHP1 mutations without neurologic symptoms (five of 26 versus four of 276 and three of 152 alleles; P < 0.001 and P < 0.002, respectively). In contrast to the variable neurologic and milder retinal phenotype of patients with NPHP1 mutations, patients with NPHP6 mutations presented with a more severe neurologic and retinal phenotype. In conclusion, NPHP1 and NPHP6 are major genes of nephronophthisis associated with JS. Epistatic effects that are provided by heterozygous NPHP6 and AHI1 mutations and variants may contribute to the appearance of extrarenal symptoms in patients with NPHP1 mutations. Joubert syndrome (JS [OMIM 213300]) is an autosomal recessive disorder that was first described in 1969 in four siblings with cerebellar ataxia, mental retardation, hypotonia, and neonatal respiratory dysregulation (1). Neuroradiologically, JS is characterized by the “molar tooth sign” (MTS), which reflects cerebellar vermis hypoplasia, thickened and elongated superior cerebellar peduncles, and an abnormally large interpeduncular fossa (2). Since its first description, the range of the JS phenotype has widened. In particular, retinal dystrophy and kidney involvement (nephronophthisis or cystic renal dysplasia) have been reported in approximately 17 and 27% of JS cases, respectively (3). Additional clinical features such as congenital saccade initiation failure (Cogan oculomotor apraxia), coloboma, hepatic fibrosis, autism, and other central nervous system malformations have been shown to be associated with JS. On the basis of the variable involvement of these organs, several JS-related disorders termed cerebello-oculo-renal syndromes have been distinguished and have as a unifying characteristic the presence of cerebellar vermis hypoplasia (4). Nephronophthisis, an autosomal recessive nephropathy that is characterized by polyuropolydipsia, mild or absent proteinuria, interstitial fibrosis, and cysts at the corticomedullary junction is the most common genetic cause of chronic renal failure in childhood. In patients with JS, three genetic loci have been mapped until recently to 9q34.3 (JBTS1: OMIM213300), to 11p12-q13.3 (JBTS2: OMIM608091), and to 6q23 (JBTS3: OMIM608629) (5–8). Of these, JBTS3 is the only locus with which a disease-specific gene has been identified, AHI1 (9,10). The phenotype that is linked to JBTS1 and JBTS3 loci was initially found to be restricted to neurologic and retinal involvement (11); however, more recently, AHI1 mutations have also been detected in patients with both JS and nephronophthisis (12,13). JBTS2 was also associated with renal and hepatic abnormalities (6,7). Of the six nephronophthisis genes identified to date (NPHP1 through 6) (14–22), mutations of NPHP6 (CEP290, JBTS5: OMIM610188) have recently been identified in patients with JS, in most cases occurring in association with nephronophthisis and severe retinopathy (21,22). It is interesting that patients with Leber congenital amaurosis and without any neurologic or renal phenotype have been found to carry homozygous intronic mutations in NPHP6 (23). Mutations of NPHP1 (also called JBTS4: OMIM609583), the majority of which are homozygous deletions, are found in a large proportion of patients with isolated nephronophthisis (45 to 60%) (24,25) and have also been identified in some patients who present with nephronophthisis associated with JS or Cogan oculomotor apraxia (25–29). The cerebellar malformations of patients with JS and NPHP1 mutations were found to be less severe, leading to a mild MTS in most of the patients (25,28,29). The NPHP1 deletion that is carried by patients with nephronophthisis and JS is not different from that found in patients with isolated nephronophthisis (25,28). Therefore, the association of extrarenal symptoms with nephronophthisis has been suggested to be explained by the potential epistatic effect of heterozygous mutations in other genes of JS (28). The AHI1 and NPHP6 genes are expressed during early brain development (10,22). Nephrocystin-1 and -6, the proteins that are encoded by NPHP1 and NPHP6, are localized in primary cilia, basal bodies, and centrosomes, similarly to other proteins that are involved in disorders that overlap with JS, such as polycystic kidney diseases and Bardet-Biedl syndrome (18,21,30). Nephrocystin-1 and -6 each possess numerous protein interacting domains that allow them to associate with various proteins, such as actin-binding proteins, microtubule-binding proteins, or the retinitis pigmentosa GTPase regulator, which is mutated in some forms of retinitis pigmentosa (31–35). Jouberin, the product of AHI1, also contains several protein-interacting domains and has been recently shown to interact with nephrocystin-1, which suggests that they lie in a common functional pathway (36). The role of jouberin and nephrocystin-1 and -6 in brain development is unknown, but the involvement of nephrocystins in ciliary function suggests a possible link between cilia and cerebellar development. No comprehensive study has been performed thus far to assess the mutation rate of NPHP1, NPHP6, and AHI1 in patients with nephronophthisis and neurologic symptoms. Furthermore, the potential epistatic effect of mutations in a second locus in patients with NPHP1 mutations and neurologic symptoms has likewise not been investigated. Here we present the mutational analysis of AHI1, NPHP1, and NPHP6 in a cohort of 28 families with nephronophthisis and JS-related symptoms. We report for the first time the presence of NPHP6 and AHI1 heterozygous mutations in patients with NPHP1 mutations and neurologic symptoms. A total of 28 unrelated families were selected from a worldwide cohort of 327 families with nephronophthisis—originating mainly from France and North Africa—on the basis of the presence of mental retardation and/or cerebellar ataxia in at least one affected child. Diagnostic criteria of nephronophthisis were (1) a history of polyuria and polydipsia with a progressive decline in kidney function leading to ESRD within the expected age range and (2) histology or renal ultrasound compatible with nephronophthisis (24). Of these 28 families, 19 had only one affected child, whereas nine were multiplex (one of which with two first-degree cousins affected), leading to a total of 38 patients. Six of the families were consanguineous. In the 19 families with only one affected child, all children had both nephronophthisis and neurologic involvement. In three multiplex families (F265, F130, and F23), one of the affected siblings (F265-2, F130-1, and F23-2) presented with a renal phenotype but without neurologic symptoms, whereas in two of these families (F265 and F130), the other affected sibling (F265-1 and F130-2) had a neurologic phenotype but no renal involvement by the ages of 10 and 7 yr, respectively (Table 1). In one family (F358), patient F358-1 had neurologic phenotype but no renal involvement by the age of 8 yr, whereas his first-degree cousin, F358-2, presented with a renal and retinal phenotype but without neurologic symptoms, giving the clinical picture of Senior-Løken syndrome (SLS). Brain imaging was available in at least one affected child in 21 families. Genomic DNA was isolated from peripheral blood by standard methods, after obtaining informed consent from the patients or their parents. Experiments were done in accordance with French ethical committee recommendations and with the Declaration of Helsinki. All 28 families were tested for homozygous deletion of the NPHP1 region using the PCR primers 765F2L, 804/6, and 187.41 (37). Patients without homozygous NPHP1 deletion were tested for heterozygous deletion by quantitative multiplex PCR using primers in NPHP1 exons 14 and 15 as well as in exon 4 of NPHS2 as a reporter (V. Morinière, INSERM U574, Paris, personal communication, February 12, 2006). To identify a potential rearrangement in a family with possible linkage to the NPHP1 locus and without identified deletion or mutation, we performed pulse-field gel electrophoresis (PFGE) and Southern blot analyses. Agarose-embedded DNA from patients and control subjects were digested with the following enzymes: SfiI, NotI, HindIII, ClaI, EcoRI, or EcoRV. PFGE was performed as described previously (38). Hybridizations were performed using probe N123 (38) and cDNA probes of NPHP1 gene that contained exons 1 to 6, exons 7 to 11, exons 12 to 14, and exons 15 to 20 (Figure 1). 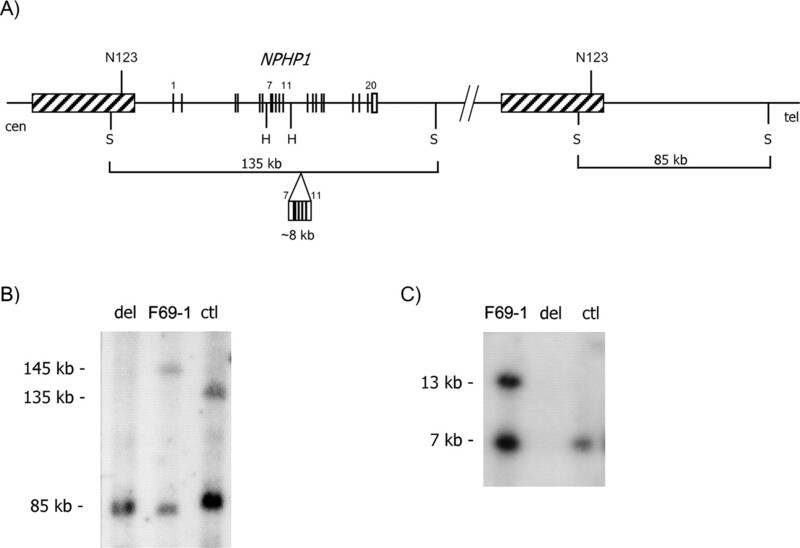 Homozygous duplication of NPHP1 exons 7 to 11 in patient F69-1. (A) Schematic representation of the NPHP1 region. The repeated regions flanking the NPHP1 gene are presented by dashed boxes; the marker N123 covering 149 bp in this duplicated area as well as the restriction sites SfiI (S) and HindIII (H) are indicated. The insertion of an approximately 8-kb genomic region that contains exon 7 to exon 11 within the 135-kb SfiI fragment is represented. (B) Pulse-field gel electrophoresis analysis of SfiI-digested DNA hybridized with probe N123. An abnormal fragment of approximately 145 kb was detected in patient F69-1, compared with the normal 135-kb fragment detected in the control (ctl), whereas no 135-kb fragment was visualized in a patient who carried the frequent homozygous NPHP1 deletion (del). (C) Southern blot analysis of HindIII-digested DNA hybridized with a cDNA probe that contained NPHP1 exons 7 to 11. As expected, the normal 7-kb HindIII fragment detected in the control subject (ctl) and in patient F69-1 was not present in a patient with the homozygous NPHP1 deletion (del). An additional 13-kb fragment was detected in patient F69-1. Restriction pattern detected with probes that hybridized NPHP1 exons 1 to 6, 12 to 14, and 15 to 20 was normal in patient F69-1 (data not shown). These data suggest the presence of a duplication of an approximately 8-kb genomic region from intron 6 to intron 11 and its insertion within NPHP1 region. Mutational screening of AHI1, NPHP1, and NPHP6 was performed by direct sequencing of the coding exons and the adjacent intronic junctions as well as of the NPHP6 intronic region that contained the c.2991 + 1655 base, whose mutation was identified in patients with Leber amaurosis (23) (primer sequences available on request). PCR products were treated with Exo-SAP IT (GE Healthcare, Buckinghamshire, UK), and both strands were sequenced using the dideoxy chain termination method on a 3130 XL DNA sequencer (Applied Biosystems, Foster City, CA) and analyzed with Sequencher 3.1 program (Genecodes, Ann Arbor, MI). Amino acid conservation at the missense mutations and their possible damaging effect were assessed using SIFT (39) and Polyphen softwares (40). Donor and acceptor sites for splicing were predicted by NetGene2 (41). At least one child was screened in each family. In addition, for identification of mutations with an epistatic effect, sibling pairs with different neurologic or retinal phenotypes both were sequenced (Table 1, F265, F130, F23, and F42). Segregation of the identified mutations was investigated in all families except for families without available parental DNA (F99 and F419). The nonsilent nucleotide changes were tested in >230 ethnically matched control chromosomes and in >150 chromosomes of unrelated patients with NPHP1 mutations but without neurologic symptoms. The detection of a predicted abnormal transcript in patients F72-1 and F419-1 was not possible because of a lack of RNA availability from these patients. We identified homozygous or compound heterozygous NPHP1 mutations in 13 families (Table 1). Thirteen patients from 10 families carried homozygous deletions of the whole gene, two unrelated patients a heterozygous NPHP1 deletion and a consensus splice-site mutation (F82-1: c.1467 + 1 G>T; F443-1: c.1027 G>A), and one patient (F69-1) a homozygous rearrangement within the NPHP1 region (Table 1). This novel rearrangement was identified by PFGE analysis; the SfiI-digested fragment that contained the whole NPHP1 gene was found to be approximately 10 kb larger in this patient than in a control subject. Further analyses showed the duplication of an 8-kb region that contained exons 7 to 11 within the NPHP1 region (Figure 1). Ten NPHP6 mutations and two variants in the consensus sequence of the 3′ splice-site were identified in seven families (Table 1). Of the 10 mutations, eight were truncating (six frameshift and two nonsense) and two were splice-site mutations that affected the obligatory G at position −1 (c.4195-1 G>A and c.3310-1 G>C; Table 1). These mutations were found to segregate with the disease. The two heterozygous variants in the consensus sequence of the 3′ splice site (c.6271-8 T>G or c.103-13 to -18 del GCTTTT) were also considered to be likely pathogenic, because they were found to decrease the scores of the normal junction sequences from 0.723 to 0.434 and from 0.939 to 0.688, respectively (NetGene2) and were not detected in >230 control chromosomes. Both patients (F72-1 and F419-1) carried in addition to the 3′ splice-site mutation a deleterious NPHP6 mutation, and in patient F72-1, in whom parental DNA was available, these two mutations were shown to be present on different alleles. In six families, the eight probands were compound heterozygous for NPHP6 mutations. In one of these families (F358), the two first-degree affected cousins carried a common mutation on one allele and one of two different mutations in the other allele. In the last family (F265), only one NPHP6 heterozygous frameshift mutation (c.287delA) was found in the two siblings, who interestingly also harbored the NPHP1 homozygous deletion (Table 1). Of note, the intronic mutation c.2991 + 1655 A>G identified previously in patients with Leber amaurosis (23) was not detected in any patient. Of patients who carried NPHP1 mutations, four heterozygous NPHP6 nonsilent variants/polymorphisms were identified (Table 2). When we compared the frequencies of these variants in (1) patients with NPHP1 mutation with neurologic symptoms, (2) patients with NPHP1 mutation without neurologic symptoms, and (3) healthy control subjects, no significant differences were found among these three groups (Table 2). Truncating AHI1 mutations were not identified in this population. Two heterozygous nonsilent variants (c.989 A>G [D330G] and c.2488 C>T [R830W]) were detected (Tables 1 and 2). The variant D330G was detected in one patient with a homozygous NPHP1 deletion (F405-1) and was found neither in 264 chromosomes of healthy individuals nor in 156 chromosomes of patients who carried NPHP1 mutations without neurologic symptoms. The aspartic acid at this position is conserved in mammals, and its change to glycine was predicted by the software program PolyPhen to be “possibly damaging” (Table 2). Therefore, this nucleotide change was considered to be a missense mutation. The other variant, R830W, was detected in one patient with NPHP6 mutations (F9-1), in one patient without NPHP1 or NPHP6 mutation (F437-1), and in five patients with NPHP1 mutations (F103-1, F110-1, F312-1, F78-1, and F168--1). Thus, its frequency was higher in patients with NPHP1 mutations and neurologic symptoms (five of 26 chromosomes) compared either with control subjects (four of 276 chromosomes; P < 0.001) or with patients who had NPHP1 mutations and lacked neurologic symptoms (three of 152 chromosomes; P < 0.002). The affected arginine, located in the WD40 repeat domain (3), is conserved in vertebrates, and its change to tryptophan is also predicted to be “possibly damaging” by PolyPhen (Table 2). In total, NPHP1 and NPHP6 mutations were found in 19 (67%) of 28 families. In the remaining nine (33%) families, no mutation was found in NPHP1, NPHP6, and AHI1. Of the 13 unrelated patients with NPHP1 mutations, two carried either a heterozygous NPHP6 truncating mutation or an AHI1 missense mutation (D330G), and five carried the “possibly damaging” AHI1 variant R830W. 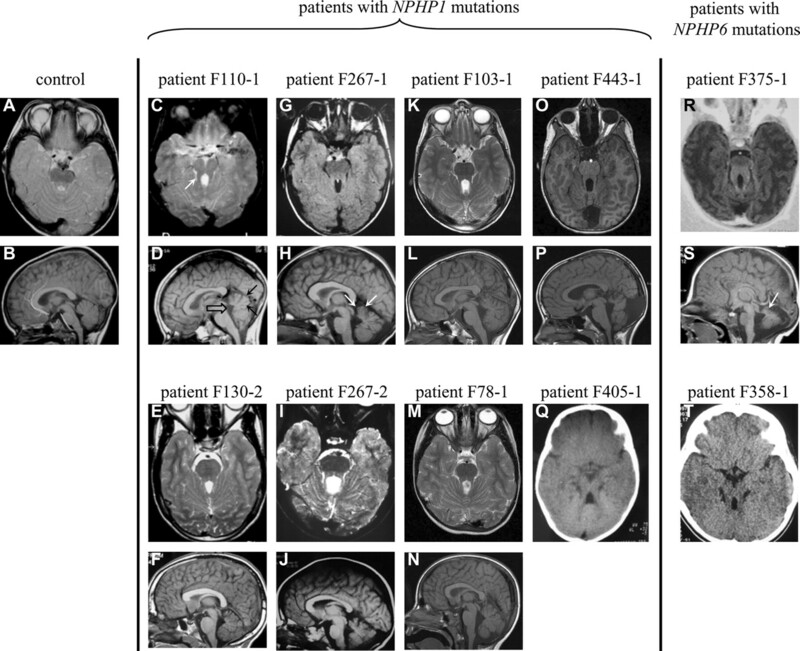 Seven of eight patients from six families with two NPHP6 mutations presented cerebellar ataxia and mental retardation (F9-1, F9-2, F72-1, F99-1, F358-1, F375-1, and F419-1). In two patients with available cerebral imaging (F358-1 and F375-1), agenesia/dysplasia of the superior vermis and MTS were detected (Figure 2). The first-degree cousin of patient F358-1 with JS presented with a phenotype that was restricted to renal and retinal involvement, giving the clinical picture of SLS (F358-2). He carried one of the two mutations of his cousin (5649insA and L1884fsX1906) and a different second NPHP6 mutation that affected a consensus splice site (c.4195-1 G>A; Table 1). All eight patients with NPHP6 mutations presented with severe retinopathy that in six patients led to complete loss of vision. Five of eight patients developed ESRD at the mean age of 16 yr (range 11 to 25 yr). Two patients had a normal GFR at the ages of 3 and 8 yr (F375-1 and F358-1, respectively), and one patient had chronic renal failure at the age of 24 yr (F419-1; Table 1). Axial and midline sagittal images in a control individual (A and B), in patients with NPHP1 mutations (C through Q), and in patients with NPHP6 mutations (R through T). Axial sections demonstrate the elongation of the superior cerebellar peduncles (white arrow in C), resulting in a mild molar tooth sign (MTS) in patients with NPHP1 mutations (C, G, K, O, E, I, M, and Q). The superior cerebellar peduncles are more thickened in patients with NPHP6 mutations, leading to a more explicit MTS (R and T). On sagittal plane, a superiorly positioned and enlarged fourth ventricle (open arrow in D), median and inferior vermis hypoplasia (black arrows in D), and superior vermis “agenesia/dysplasia” (white arrows in S and H) are noted. None of the patients had any supratentorial abnormality. In contrast to the patients with NPHP6 mutations, most of the 16 patients with NPHP1 mutations presented with a variable neurologic phenotype and a milder retinal involvement. Mental retardation and oculomotor disorder were their most frequent neurologic symptoms, both involving 12 of 16 patients. Eight of 15 patients with available clinical information developed cerebellar ataxia, of whom all seven patients with available brain imaging showed elongation of the superior cerebellar peduncles resulting in a mild MTS on axial images (Figure 2). The cerebellar vermis was found to be dysplastic in its superior part and hypoplastic in its middle and inferior segments in all of these patients (Figure 2, sagittal images). Furthermore, retinopathy affected only half of the patients with NPHP1 mutations and did not lead to complete loss of vision in any of them. Eleven of 16 patients developed ESRD at the mean age of 11 yr (range 7 to 18 yr). Three patients with NPHP1 mutations had a normal GFR at the ages of 5, 7, and 10 yr (F443-1, F130-2, and F265-1, respectively), and two patients had chronic renal failure at the ages of 8 and 12 yr (F267-1 and F103-1, respectively; Table 1). Two of three sibling pairs who carried the NPHP1 homozygous deletion (F265 and F130) presented marked intrafamilial variability of neurologic symptoms. For instance, patient F265-1, who carried an NPHP1 homozygous deletion and an NPHP6 heterozygous frameshift mutation, presented with the clinical phenotype of JS with hypotonia, autism, mental retardation, and retinopathy. His sister, F265-2, who carried the same NPHP1 and NPHP6 mutations, however, presented with a milder clinical phenotype, with retinopathy but neither autism nor mental retardation (Table 1). Here we report a high NPHP1 and NPHP6 mutation rate in JS associated with nephronophthisis and the potential epistatic effect of heterozygous NPHP6 and AHI1 mutations and variants in patients who carry NPHP1 mutations with neurologic symptoms. Both NPHP1 and NPHP6 were found to be major genes in JS with nephronophthisis. Nineteen (67%) of 28 unrelated patients were homozygous or compound heterozygous for NPHP1 (46%) or NPHP6 (21%) mutations. The high proportion of NPHP1 mutations in this population was unexpected on the basis of previous studies that showed an NPHP1 mutation rate of 4 to 8% in patients with JS and retinal or renal involvement (28,29). This striking difference can be at least partly explained by the fact that in the previous studies, only a small proportion of patients presented with nephronophthisis (20%  and 25% ), whereas in our study, the presence of nephronophthisis was a selection criterion. Taking into account only patients with JS and nephronophthisis in the cohort of Parisi et al. (28), the proportion of patients with NPHP1 mutations (two of five patients) is similar to our result. By contrast, we confirm that AHI1 is not a major gene in nephronophthisis that is associated with JS, in agreement with the study of Valente et al. (3), who did not find any AHI1 mutations in 37 patients with JS and kidney involvement. The retinal and neurologic involvement was severe in all patients with JS and NPHP6 mutations, which is in agreement with previous findings (21,22). Their renal function seemed to decline less rapidly compared with patients with NPHP1 mutations, because none of the patients with NPHP6 mutations developed ESRD by the age of 10 yr, whereas half of the patients with NPHP1 mutations did. However, in the cohort of Sayer et al. (21), most patients with NPHP6 mutations developed ESRD already at approximately the age of 11 yr, and the number of patients with NPHP6 mutations in our study is too low to assess properly the age at the onset of ESRD. Patient F358-2 with SLS, in contrast to his cousin who had JS (F358-1) and carried two truncating NPHP6 mutations, harbored along with the common frameshift truncating mutation in exon 41 a consensus splice-site mutation of exon 33. Similarly, a homozygous consensus splice-site mutation of exon 22 was found by Sayer et al. (21) in a family with SLS. Considering our findings and those of Sayer et al., one can hypothesize that these splice-site mutations do not lead to frameshift and protein truncation but rather to partial deletion of one of the coiled-coil domains. This mutated protein allows normal neurologic development but results in retinal and renal defects. Reinforcing this hypothesis is the congenic mouse strain rd16, which develops pigmentary retinopathy as a result of a homozygous in-frame mutation of the murine ortholog of Nphp6 that leads to a lack of exons 26 to 29 (35). The absence of this region seems to disturb the interaction of nephrocystin-6 with retinitis pigmentosa GTPase regulator and may explain the isolated retinal phenotype without neurologic or renal involvement in the rd16 mice. Thus, the type of NPHP6 mutation seems to influence largely the degree of neurologic involvement, leading either to an apparently complete neurologic phenotype of JS or to the lack of neurologic symptoms as in SLS. Further functional studies are needed to clarify the effects of these identified splice-site mutations on their resultant proteins. In our cohort of 152 patients with NPHP1 mutations from 104 families, 14 (9%) patients from 13 (12%) families presented with JS-related neurologic symptoms. Similarly, Caridi et al. (25) found JS-related symptoms in five (9%) of 56 patients with NPHP1 homozygous deletions. Combining the results of previous studies, cerebellar malformations on brain magnetic resonance imaging were found in seven of eight unrelated patients with neurologic symptoms and NPHP1 mutations (25,28,29). However, most of these patients showed less severely affected superior cerebellar peduncles associated with a mild MTS on axial images (25,28,29). Consistent with these findings, in our series, the cerebellar malformations that were seen in patients with NPHP1 mutations and cerebellar ataxia seemed to be similar but less severe compared with the malformations that were found in patients with NPHP6 mutations, either in the present or in a previous study (22). The superior cerebellar peduncles in patients with NPHP1 mutations were found to be elongated but in most of them not as thickened as in patients with NPHP6 mutations, leading to a less explicit MTS. The neurologic phenotype of patients with NPHP1 mutations, similar to previous data (25,28,29), was found to be highly variable, even in the same family, fulfilling rarely the complete picture of JS. The association of neurologic symptoms cannot be explained by a contiguous gene deletion syndrome because (1) the extent of the NPHP1 deletion was found to be the same in patients with or without extrarenal symptoms (28,29), (2) siblings who carry the same deletion may present with dramatically different extrarenal involvement, and (3) patients who carried heterozygous deletion and point mutation or homozygous partial duplication in this study also developed similar neurologic symptoms. Therefore, the presence of neurologic symptoms in a minority of patients with NPHP1 mutations and their inter- and intrafamilial variability are puzzling. An offered explanation could be the coexistence of a “third” mutation exerting an epistatic effect in another JS-related locus (28); however, such an epistatic effect has never been reported. We detected an NPHP6 heterozygous truncating mutation in one sibling pair and an AHI1 missense mutation (D330G) in one patient, all simultaneously carrying NPHP1 homozygous deletion. Furthermore, the AHI1 variant R830W was enriched in patients who harbored NPHP1 mutations with neurologic symptoms compared with those without neurologic symptoms or with healthy control subjects. The R830W variant affects an evolutionarily conserved amino acid located in the WD40 repeat domain, a domain that is known to allow specific protein complexes to assemble. A missense mutation within this domain has already been reported in a patient who presented with JS (3). Although the size of the population studied is not adequately large enough to assess properly the enrichment of R830W in patients with neurologic symptoms, these data suggest that this variant makes the patients with NPHP1 mutations more susceptible to develop neurologic symptoms. The identification of second-locus mutations and variants in half of the patients with NPHP1 mutations reinforce the hypothesis that the epistatic effect that is provided by these genes contributes to the appearance of neurologic symptoms in patients with NPHP1 mutations. As can be expected on the basis of the wide range of phenotypes, the identified “third” mutations and variants in a second locus are not sufficient to account for all phenotypic variability, suggesting that other genes are involved. The neurologic status of the sibling pair with a homozygous NPHP1 deletion and a heterozygous NPHP6 truncating mutation was dramatically different; only their similar retinopathy phenotype can be explained by the epistatic effect of their common NPHP6 mutation. Similarly, patients who harbored both NPHP1 mutations and the AHI1 R830W variant did not present with the same neurologic phenotype. Of note, because similarly discordant phenotypes have been found in monozygotic twins with JS—with autism and severe mental retardation in one and no neurologic symptom in the other twin (42)—nongenetic factors must also be taken into consideration. It is interesting that a similar epistatic effect was found in patients with Bardet-Biedl syndrome (BBS), another cilia-related disease that is characterized by cystic kidney disease, pigmentary retinal dystrophy, and mental retardation (30). Indeed, the association of a homozygous mutation in one gene and a heterozygous mutation in a second gene has been reported in some patients with BBS. Moreover, inter- or intrafamilial variability is observed in these patients, suggesting a more complex mechanism of inheritance (43,44). The nephrocystin proteins are known to be part of complexes that are localized to basal bodies/centrosomes (18,21,34), and nephrocystin-1 has been shown to interact with jouberin (36). It is tempting to assume that jouberin and the nephrocystins may be part of the same basal body/centrosomal complex and participate in concert with ciliary function. However, the effects that are exerted by the identified heterozygous NPHP6 and AHI1 variants on ciliary function that are already affected by the lack of nephrocystin-1 remain to be investigated. Altogether, our results suggest that a classical mendelian inheritance is not sufficient to explain all cases of JS and nephronophthisis. An oligogenic model of inheritance might be more relevant in some patients. NPHP1 and NPHP6 are major genes of nephronophthisis associated with JS-related neurologic symptoms, accounting for roughly two thirds of the cases. In general, patients with NPHP1 mutations tend to have a variable neurologic and milder retinal phenotype, whereas patients with NPHP6 mutations tend to develop a severe neurologic and retinal phenotype. Our finding that several patients with NPHP1 mutations and neurologic symptoms carry either a mutation in a second locus or the possibly damaging AHI1 variant R830W strongly supports the notion that epistatic effects that are provided by these genes or other genes as yet uncharacterized contribute to the appearance of extrarenal symptoms. This work was supported by the Institut National de la Santé et de la Recherche Médicale, the Fondation Recherche Medicale (grant to K.T. ), the Association pour l'Utilization du Rein Artificiel, and the GIS-Maladies Rares. We thank the patients and their families for participation. We acknowledge Anne Legall for excellent technical assistance and Marie-Claire Gubler and Nathan Hellman for careful reading of the article. We are grateful to the following physicians for contribution of material and clinical data from patients: Chantal Loirat, Anne Maisin, Odile Boespflug-Tanguy, Christine Pietrement, Claire Gazengel, Jean-Luc André, François Berthoux, Gian-Franco Rizzoni, Djamil Hachicha, and Isabelle Desguerre.